Ratings roundup is a rundown of rating news from the past week and is derived from press releases and reports around the industry. 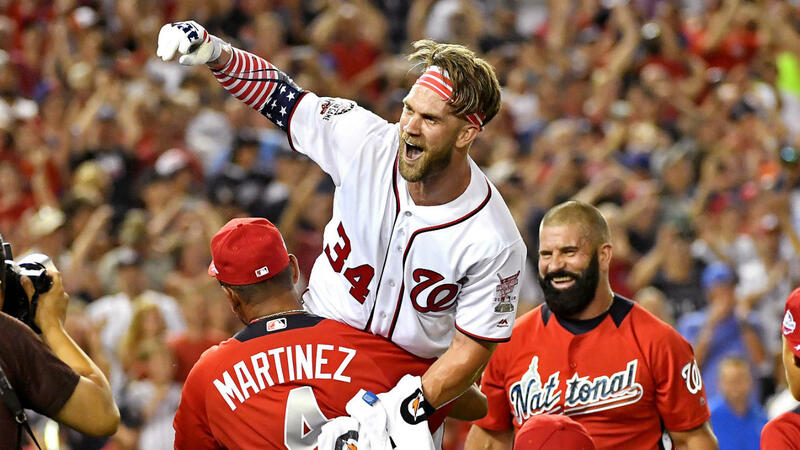 In this week’s edition, the 2018 MLB Home Run Derby was won by Bryce Harper, the MLB All-Star game was won by the American League after an extra-inning affair, the final numbers of the 2018 FIFA World Cup are compiled, ladies and gentlemen play at Wimbledon concluded in London, Fox Sports West telecasts of the Los Angeles Angels are the highest rated for any team in the first half, and Braves telecasts on Fox Sports South/Southeast are a close second. 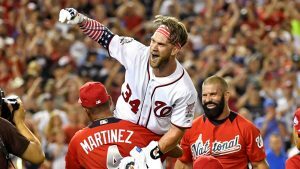 Richard Deitsch of the Athletic reported that the 2018 MLB Home Run Derby drew 5.567 million viewers — over 2.5 million less viewers from last year’s event (8.167 million in 2017). The Derby earned a 3.3 rating with a 1.8 in adults 18-49 and 1.5 in adults 18-34 demos. Despite the low ratings, the event was the highest rated program for Monday night. As for the All-Star Game, the contest delivered a combined 8,849,000 viewers across Fox, Fox Deportes, and Fox’s streaming services. Fox registered a 5.2/11 household rating/share with 8.7 million viewers. On Fox’s streaming services, Tuesday night’s game delivered an average minute audience of 91,000 and 254,000 unique streamers — making it the most streamed MLB All-Star Game ever. The average minute audience figure is up an impressive +84% over last year’s All-Star Game (vs. 49,000) from Marlins Park in Miami and is up +23% compared to Fox Sports’ 2017 American League Divisional Series average (74,000). Baltimore, +7% (7.4/13 vs. 6.9/12). Tuesday night’s game drew a 6.5 overnight rating, according to Austin Karp of Sports Business Daily. The event did not see an increase or decline from last year — the 2017 exhibition finished with the same overnight rating. Fox Sports’ delivery of the FIFA World Cup Final peaked at 14,620,000 viewers on the Fox broadcast network Sunday. France’s dominant 4-2 victory over Croatia averaged 11,824,000 viewers across Fox and streaming sources. France’s win was the most-watched non-NFL telecast of any kind on Fox in 2018, and the most-watched telecast on television since the NBA Finals among Men, Women, and Adults 18-34 and 18-49. It was the first FIFA World Cup Final not to go to extra time since 2002, and the first World Cup Final where a team held a three-goal lead before the 90th minute mark since 1970. As the leader in live sports consumption, Fox and FS1 coverage of the FIFA World Cup, airing in morning and early afternoon time slots in the U.S., accounted for all 20 of the top-20 shows among Men 18-49 in English-language TV over the last month. In addition, the World Cup delivered the 15 most-watched soccer matches since the 2015 FIFA Women’s World Cup. With a live-match average-minute audience of 552,000 on streaming platforms, the 2018 FIFA World Cup Final delivered the largest authenticated Sunday event in Fox Sports history — surpassing the 2018 NFC Championship by 18% (468,000 AMA). FIFA World Cup content delivered 3.6 billion total minutes and 558 million total video views across streaming, digital, and social platforms. Prior to the 2018 FIFA World Cup, the previous record for a one-month period was October 2017, with 1.5 billion total minutes. Streaming alone amassed a total of 2.6 billion minutes, 87 million views, and 9.1 million unique streamers. Fox Sports unique partnerships across digital and social platforms paid major dividends, as World Cup Now, a Twitter-only program hosted by Rachel Bonnetta, delivered 7.1 million video views. On Snapchat, 30 million U.S. viewers watched Fox Sports-partnered World Cup content, with more than 70% of the audience under the age of 25. The FIFA World Cup Highlight Machine, sponsored by adidas and developed in cooperation with IBM Watson, had nearly 800,000 video views. With France winning Sunday’s 2018 FIFA World Cup Russia final, Telemundo Deportes wrapped up its first-ever World Cup by delivering record audiences across its linear and digital platforms, while garnering unprecedented exposure for programming in all dayparts and for its owned and affiliate partners. Powered by NBC Sports Group’s Playmaker Media, TelemundoDeportes.com, and the Telemundo Deportes En Vivo, NBC Sports and Telemundo Station apps, Telemundo Deportes live streamed 1,000+ total hours of World Cup content across desktops, mobile devices, and tablets, plus connected TVs for the first time. Telemundo Deportes’ digital presentation reached 15.5 million unique users, generating a record-setting 130 million live streams AND 1.96 BILLION live minutes viewed – which makes Telemundo’s 2018 World Cup the biggest live stream sports event in Spanish-language history. Telemundo Deportes also delivered the 50 most-live streamed games in Spanish language history. The World Cup proved to attract a significant number of new viewers to Telemundo – through the Semifinals, 50% of Telemundo’s Adult 18-49 World Cup audience had not watched the network’s prime time in the 30 days prior. A total of 25.8 million viewers watched the FIFA World Cup on CTV, TSN, and RDS — 72% of the Canadian population. Preliminary overnight data from Numeris confirms that an average audience of 3.9 million viewers watched the FIFA World Cup Final on Sunday. Audiences peaked at 5.4 million viewers at 12:53 p.m. ET as France secured their second-ever FIFA World Cup victory. France’s win over Croatia was the most-watched match of the tournament, with a total reach of 9.3 million unique Canadian viewers, or 26% of Canadians, tuning in for the Final. TSN and CTV were the first and second-most-watched networks of the day, respectively. The strong audiences for the Final reflect the network’s solid performance throughout the FIFA World Cup, as Canadians watched a total of 200 million hours of coverage during the tournament on CTV, TSN, and RDS. CTV and TSN were the first and second-most-watched networks during the tournament, respectively, as TSN fortified its position as Canada’s most-watched specialty network. Additionally, the England vs. Croatia semi-final match was the second-most-watched match of the tournament, attracting an average audience of 2.5 million viewers on CTV, TSN, and RDS. TSN digital platforms recorded strong numbers throughout the tournament for both live and on-demand video content, with the FIFA World Cup becoming the most-streamed event in the network’s history. Throughout the tournament, TSN digital platforms recorded 7.3 million video starts, with TSN Direct users accounting for 38% of all live stream starts (nearly 1.2 million total). Meanwhile, the England vs. Croatia semi-final was the most-streamed match, with more than 155,000 video starts. TSN’s social media platforms also attracted strong viewership, with FIFA World Cup videos accounting for more than 16 million YouTube views, representing nearly 739,000 hours of video content consumed through YouTube alone. TSN’s Twitter account received substantial engagement, with its top tweet accumulating nearly 1,500 retweets and its most-viewed video surpassing 80,000 views. TSN’s Instagram account featured two videos with more than 560,000 views each, while its top Facebook video received 94,000 views. Saturday’s Wimbledon Ladies’ Championship on ESPN earned a 2.1 overnight rating — up 27% from a 1.7 in 2017 (Garbine Muguruza vs. Venus Williams). It was ESPN’s highest since 2015 (2.2 for Serena Williams vs. Muguruza). The rating for the 75-minute match peaked at 2.4 in the final quarter hour (12:15-30 p.m. ET). The match averaged 2.697 million households in Nielsen Fast National ratings (based on a 1.8 rating), up 32% from 2017 (2.039M for Muguruza vs. Venus Williams, based on a 1.4 rating). It was ESPN’s largest audience for the event since 2012 (2.831M for Serena Williams vs. Agnieska Radwanska), the first year ESPN televised the Finals. On the gentlemen’s side, the remarkable serving duel between Kevin Anderson and John Isner won by Anderson 26-24 in the fifth set followed by three sets of Rafael Nadal vs. Novak Djokovic, earned a 1.0 overnight rating. That is 25% higher than 2017 (0.8) despite the telecast being extended four hours (8 a.m. – 6 p.m.). Also, it is the highest overnight rating ESPN has earned for that day of the Wimbledon fortnight since 2015 (1.0). Through the first half of the 2018 MLB season, viewership of Los Angeles Angels telecasts on Fox Sports West has delivered the highest year-over-year (YoY) ratings increase of any MLB team. 2018 is also positioned to become the highest rated Angels season on the regional sports network since 2005. Fox Sports West was the most-watched cable network in the LA DMA when the Angels played in primetime. At the All-Star Break, current local-market household (HH) ratings on Fox Sports West are trending +79% higher than last season at the break. The Angels are generating YoY increases across key demographics, including: Adults 18-49 up +93% and Adults 25-54 up +67%. Atlanta Braves ratings on Fox Sports South and Fox Sports Southeast delivered a 3.09 average household rating in the Atlanta DMA. This is a 51% uptick versus the same number of games in 2017, marking the highest year-over-year (YoY) household ratings growth of any National League team, and the second highest across all MLB teams. Atlanta Braves telecasts on Fox Sports South and Fox Sports Southeast in the Atlanta DMA also rank #1 in prime on cable TV with a 3.29 primetime HH rating average since the start of the season, beating the average of all other cable networks. Among all television in the Atlanta DMA, Braves games on the networks rank #2. The networks’ social media platforms have also delivered substantial gains since Opening Day with Braves content on Fox Sports South’s Facebook, Instagram, and Twitter accounts; engagement is up 554% and video views are up 134% versus the first half of the 2017 season. Highest-Rated Game: Monday, July 2, at New York Yankees (5.46 HH rating) on FOX Sports Southeast. Highest-Rated Braves LIVE Pregame Show: Sunday, July 15, versus Arizona Diamondbacks (1.54 HH rating) on FOX Sports South. Highest-Rated Braves LIVE Postgame Show: Sunday, May 20, versus Miami Marlins (3.61 HH rating) on FOX Sports South. Highest Peak Rating: Monday, July 2, at New York Yankees (6.87 HH rating in 10:00-10:15 p.m. ET window) on FOX Sports Southeast. Highest-Rated Series: Three games at New York Yankees on July 2-4 averaged a 4.49 HH rating on FOX Sports Southeast. Tuesday, June 12, versus New York Mets (3.41 HH rating) on FOX Sports Southeast outperformed ESPN’s telecast of the same game by 142%. New York Yankees games on the YES Network this season rank #1 in average TV HH ratings in Primetime in the New York DMA, beating the Primetime averages of all other broadcast and cable TV networks in the market. More than 4 billion minutes of Yankees games on YES have been consumed so far this season on YES in the New York market, and 95% of viewers watching the Yankees on YES are watching live. More than 4 billion minutes of Yankees games on YES have been consumed so far this season in the New York market, which is half a billion minutes more than the amount of minutes consumed in the first half of the 2017 season; YES is on pace to surpass the 6.94 billion minutes of Yankees games on YES that were consumed in the New York DMA for all of the 2017 season.